I first met Carrie and Tony Requist of U Grok It in February of 2012. We were hosting a DEMO event with VentureBeat and UGrokIt was one of a handful of companies that was chosen to come in and pitch. I remember the U Grok It presentation well for a number of reasons. For starters, Carrie and Tony are married. And living in Steamboat. Both pretty unusual for the startup world. And they were building a simple smart-phone based RFID reader with the idea of creating a consumer product that would allow individuals to easily and cheaply track their stuff – a problem I’m quite familiar with as I have an uncanny propensity to misplace things (there was much joking in the meeting about this, in fact). I stayed in touch with them after that first meeting and occasionally Carrie would swing by Boulder on her way in or out of town to update me on the company’s progress. As many businesses do, U Grok IT took many twists and turns as they figured out how to turn their prototype into a production unit and honed in on what they eventually found was a much larger opportunity – providing a enterprise class (but still smartphone based) RFID reader that was an order of magnitude cheaper and significantly easier to use than the special purpose units that had been on the market relatively unchanged for the past 15 years. All this while scrapping funding together on an almost continual basis. I was impressed – mostly with their scrappiness but also with the progress of the idea and the business. And as I sat listening to the latest update about a month ago I finally had the right mechanism through Foundry’s FG Angels syndicate to actually support them and the business. I wrote a post a while ago about the 10 year entrepreneur that described the often long, less celebrated journey typical of most entrepreneurs as they built their businesses (contrasted with what sometimes is glorified in the tech press). The story of UGrokIt’s funding is in the same vein. Perseverance in the business and in continuing relationships pays off. 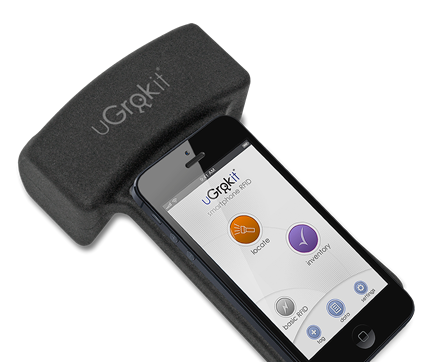 I’m excited to be working with Carrie, Tony and the entire UGrokIt team.